PRESS RELEASE: Arturia announces the release of its latest addition to the Analog Experience Series: Analog Experience The Player. By combining a dedicated controller-keyboard and a native software application, Analog Experience The Player is offering a straightforward, innovative and enjoyable experience. 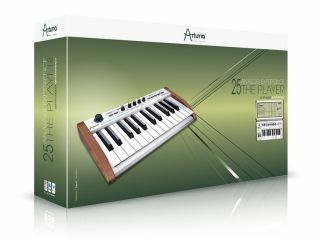 The software features 1000 classic Arturia synth sounds made from the company's flagship software synthesizers (Minimoog V, Prophet V, ARP 2600 V, Jupiter 8V). With straightforward editing functions, there is access to the essential parameters, making sound design easy - and a blast. And the smart preset manager allows getting the sound needed without wasting time scrolling through endless menus. With an ultra-thin aluminium and wooden case, 25 full sized velocity sensitive keys and the new MIDI control center, this keyboard integrates perfectly into the setup as an external controller as well, and was made for the road - perfect for musicians on the go! -Ultra-thin aluminum and wooden case. - Plug and play: the Hardware and Software instantly recognize themselves and offer perfect integration. - Full compatibility with major formats and hosts on Mac OS X and Windows XP/Vista/ 7 (VST, AU, RTAS).